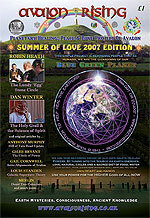 The Avalon Rising Radio Show started on Tuesday 21st September – Autumn Equinox 2010 till Spring 2011. It was hosted by Hugh Newman on Glastonbury Radio. Andrew is speaking at Megalithomania South Africa this month. Click here for info. Andrew is the author of numerous groundbreaking books that challenge the way we perceive the past. They include From the Ashes of Angels (1996), which shows that the Watchers of the book of Enoch were shamans responsible for the Neolithic revolution, and that their homeland—the biblical Eden—was southeast Turkey, where archaeologists have recently found the oldest stone temple in the world – Gobekli Tepe, a subject he discussed at Megalithomania 2010 & is available as a DVD here. It is also a subject we discuss in the show. His most recent book, Beneath the Pyramids, explores Giza’s cave underworld, rediscovered by the author in 2008 and sheds a whole new light on the prehistory of Egyptian Civilization. He holds the annual Questing Weekender in Wiltshire every Autumn Equinox. Klaus is speaking at Megalithomania South Africa this month. Click here for info. Klaus has been organizing cultural exhibitions since 1991 in Austria, Japan and Korea. Being a specialist in culture and art exhibitions, his attention was automatically drawn to a phenomenon called ‘Ooparts’ – out of place artifacts. These are artifacts that should not exist according to current science. Klaus has been researching these types of artifacts for over a decade and, after a long preparation, decided to set up an exhibition of 470 of these (Ooparts) pieces, which he called ”Unsolved Mysteries”. this includes artifacts from places such as Colombia, Bolivia, Peru, Ecuador, Mexico and many other countries. Its amazing how he has been able to display such pieces – because museums usually bury these in their basements to avoid raising uncomfortable questions. A large portion of the pieces are scattered around the world and held in secret private collections. Klaus Dona has been able to research more than 3500 pieces, all of which have no logical explanation! Christian has appeared at many Avalon Rising events over the years and is an Architect, House Whisperer, Philosopher, Writer, Telepath, Architectural & Environmental Psychologist, Interior Designer, Film-maker, Composer, Musician, and Feng Shui/ Geomancy Consultant. He works with the Harmonics of Spatial Energy – the Music of Buildings, and has helped to substantially change and transform peoples spaces and lives. He is the co-founder and teacher of the London School of Feng Shui. He designs new and adapts existing buildings incorporating feng shui and classical principles of architecture, sacred geometry and proportion, musical ratios, harmonic resonance, spatial harmonics and Ki energy matrix structures. Karen Sawyer is a writer, artist, and musician living in Wales. She is author of ‘Soul Companions’ , a book with numerous interviews with healers, shamans and visionaries. Her second book ‘The Dangerous Man’ has a collection of 32 interviews with those who challenge convention, presenting new and exciting ways of thinking about history, science, politics, and the nature of reality and life as we know it. Karen organises the ARC Convention in Bath, bringing people together to share resources and information to inspire others on their journey, with guest speakers from her two books. It happening on 19th – 20th Feb. Come along, or watch it live-streamed via the website. Freeman-on-the-Land, Lawful Rebellion, De-registration from the State, Parking Fines, Serving a ‘Notice’ and much more. Since freeing himself of “employment” (which after all is defined as “to keep busy and occupy”!) he has been on a journey to freedom which really came to a head when he became interested in the Freeman On The Land concept. He has set up a project and website, managed by his close associate A. Freeman, under which he aims to fully test the concept and determine the best ways in which it can be achieved as a way of life. Clare Hedin is a long time practicing Sound Artist, Consciousness Explorer & Healer. She teaches classes on Creativity and Intuition. Trained in piano at 7 and subsequently learning saxophone(s), hand drums, shruti box (squeeze box) and bowls, Clare uses these characters to support the telling and singing of life stories with her voice. She teaches and performs internationally and taught for 5 yrs at Sound Healing Center, San Francisco, CA since its inception, as well as taking healing music into the Oakland Children’s Hospital (think St. Ormonds) to work with sick children and their families for a number of years – using her original music. Her gift is being able to read what is going on in a room and respond accordingly, always aiming for depth and truth in connection. The Hall of Records, Atlantis, Gobekli Tepe, Mayan Knowledge, Zechariah Sitchin, The Starchild Skull, Ancient ET Contact, Chemtrails, the Global Agenda,Codex Alimentarius and much more. Geoff Stray has been studying the meaning of the year 2012 since 1982. Around 1996, he started to compile the information into a booklet called Beyond 2012. In September 2000, he made it available on the internet via the website www.diagnosis2012.co.uk. Since then, Diagnosis2012 has become renowned as the most comprehensive database available on 2012, and has gathered input from every corner of the globe. Geoff has given presentations on the topic across England and in countries as far afield as Belgium, USA and Peru. In his spare time, he makes handmade footwear, rides a dirt bike and “plays the blues harmonica to passing sheep”. Geoff currently lives in Glastonbury and has published three books – Beyond 2012: Catastrophe or Ecstacy?, The Mayan and other Ancient Calendars and 2012 in your Pocket. Besides all of the above, Geoff has appeared in documentaries such as ‘2012: The Odyssey’; ‘Timewave 2013’; ‘2012 – An Awakening’; ‘2012 – Mayan Prophesy’ and ‘The Shift of the Ages’, and has also appeared on Edge Media TV (Sky Channel 200) several times. Crop Circles, Orbs, Faeries, psychedelics, Ayahuasca, Terence Mackenna, Ancient Sites, Earth Energies and more. Nabta Playa, Giza Pyramids, African Origins, Archaeoastronomy, Megalithomania Egypt Tour, Megalithic Egypt and much more.